Find hotel near Jolleys Boathouse Restaur .. 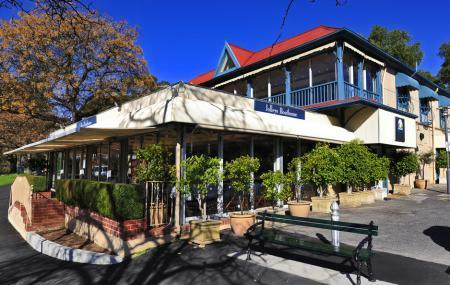 Located along the banks of the Torrens River, Jolleys offers great views with a fine dining experience. Clean modern decor, a 180-degree view, an interesting menu and extensive wine list make this a real special place to visit when in Adelaide. The staff is warm and friendly and the service is known to be generally good. Do try some of their signature dishes and delicious desserts. The place tends to get busy in the evenings so reservation in advance is recommended. Open for Lunch from 12 pm onwards except Saturday. Open for Dinner from 6 pm onwards. How popular is Jolleys Boathouse Restaurant? People normally club together Harbour Town and Adelaide Zoo while planning their visit to Jolleys Boathouse Restaurant. Really great service by Natasha and the beef burger was perfect meal prior to the footy. The steak was also cooked to perfection. Will definitely return but hoping the wine list has added additional varieties to make it interesting. Thanks. Great staff and great food. The chef has a penchant for nuts, herbs and spices that impacts the food, in a good way. One of the great views in Adelaide. Not cheap but treat yourself on a special occasion. Good view of the torrens, nice relaxed atmosphere. Service was excellent and genuine. Food was high quality and well presented. Although our mains were slightly delayed, they were definitely worth the wait. Devoured them in minutes. Overall, 4.5 out of 5. A place i would come back for sure! Did the tasting menu at lunchtime. The venue was not particularly busy with lots of empty tables but they still rushed us through it bringing the next course out before we had finished the previous one. They also didn’t change our plates between each course and we kept having to ask for a fresh plate. No one wants to eat a steak that is covered in fish sauce from the previous course. The food was really nice but we wouldn’t go again as the service let it down. The food was nice but the restaurant was poorly organised, some of the wait staff were rude and basic tasks like fetching a menu took asking several times. If the wait staff were more helpful and better organised then I'd happily recommend it. Based on my experience tonight, I would not.